Beacon Press recently released the new memoir, Dirt Work: An Education in the Woods by author and “traildog” Christine Byl. Dirt Work tells the story of Byl’s years working as a traildog in the National Parks of Montana and Alaska. In Dirt Work: An Education in the Woods, Christine Byl takes readers deep into the gritty and hardscrabble work of a professional trail builder. Dirt Work tells the story of Byl’s years working as a traildog in the National Parks of Montana and Alaska. In the book, Byl recalls long days of clearing brush, digging ditches, building bridges, cleaning up after forest fires, and blasting snow; offering the reader an intimate look at life on the trails. She explores the language, tools, skills, and fraternity of “traildog” work, writing candidly about the harsh living conditions, injuries, and insecurities that come with the job. Byl wrote a guest post for Half Past Done as part of her online book tour. We also have one copy of Byl’s new book to give away. For a chance to win, leave a comment at the end of this post. Alaska is full of endurance events and people who push themselves to their limits, from the well organized to the sponsored to the DIY (my neighbor’s statewide epics can’t be found online because she hardly knows how to use a computer.) The Tour of Anchorage ski marathon happens annually in our biggest city, a bedrock date of the winter calendar, and it draws participants from the pro ski-race circuit to grandparents out with their middle-schoolers. In the summer, hardly a week goes by without some adventure race or distance event, front-page news in the local paper. But despite my admiration for endurance athletes and an annually postponed resolution to ski the Tour myself, my own performance history is not event-based, or even recreational. For most of my twenties, my only sponsor-banner was the National Park Service arrowhead patch. I was a traildog. 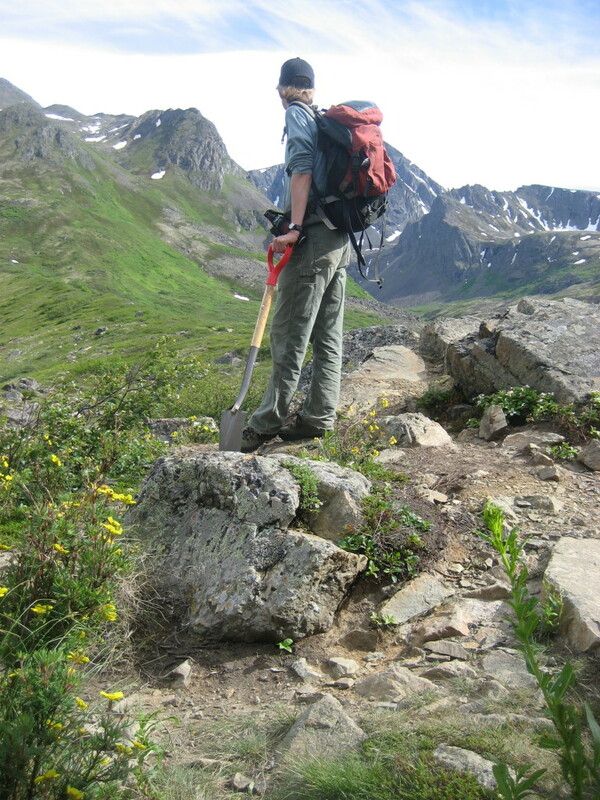 Specifically, a member of a backcountry trail crew in Glacier National Park, one of the premiere mountain trail parks in the country. A week into my first season on the job, I realized that this was no ordinary summer undertaking. Trying to keep up with the expert, fit, and no-nonsense crew I’d joined (late, and totally green) was going to take some serious grit. Luckily, in the absence of a bottomed-out resting pulse or any muscles to speak of, I had the excessive stubbornness and the desire to push myself that anchors any endurance activity. I was determined not to give up, though I had to settle for last in line, at least for a while. The list of trail crew feats contained plenty of typical exploits—fast, steep hiking; long days carrying heavy packs; fording rivers—as well as some particular to the tasks at hand—massive rocks to move, a chainsaw on your shoulder for 10 hours, sprinting to stay ahead of the mule string and a grumpy cowboy. Despite my initial ineptitude, the combination of outdoors, camaraderie, and pure effort hooked me. I loved pushing myself. I loved the exhaustion at the end of a ten-hour day, not to mention a 10-day hitch, and I loved the gang I’d joined. Never mind that I spent more time with my hands on my knees trying catch my breath than anything. We were, as one ranger called us, industrial athletes. I still get out on endurance trips as often as I can. I love long ski tours, mountain expeditions, and the occasional mushing trip (sled dogs: talk about endurance athletes!) But the Alaskan endurance customs that I love most are not recreational at all. The Alaska Native people who’ve made this lovely, severe place their home for over ten thousand years embody a dogged persistence blended with joyful celebration of effort in a way that underlies the state’s culture. Many Alaskans’ most consistent epics include the tasks that make up living: cutting, hauling and chopping ten cords of firewood; three-day sleepless dip-netting trips to fill the freezer with sockeye salmon; packing 500 pounds of moose meat out of a remote hunting camp. These statewide subsistence rituals are practiced from off-grid farmsteads to bush cabins to city apartments. Just like in my Glacier days, I love being a member of this crew. I love learning from experts, pushing past the wall when I want to quit, and falling deeper and deeper in love with a place. Breathless. 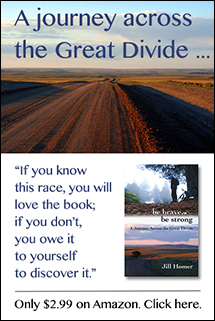 Book giveaway and call for comments: What is your favorite trail? 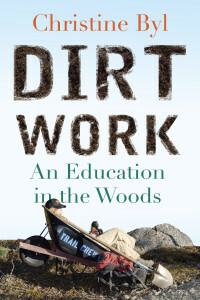 Leave a comment below for a chance to win a copy of Dirt Work: An Education in the Woods. Please make sure you provide a valid email address when you comment so that I can reach you. Contest open to residents of the United States and Canada only. The winner will be chosen randomly on Friday, May 3. 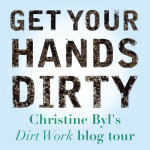 For a sneak peak, read the intro to Dirt Work. Check out Byl’s final stop on her online book tour on Saturday, April 27 at Hiker to Hiker. Half Past Done will post a book review at a later date. 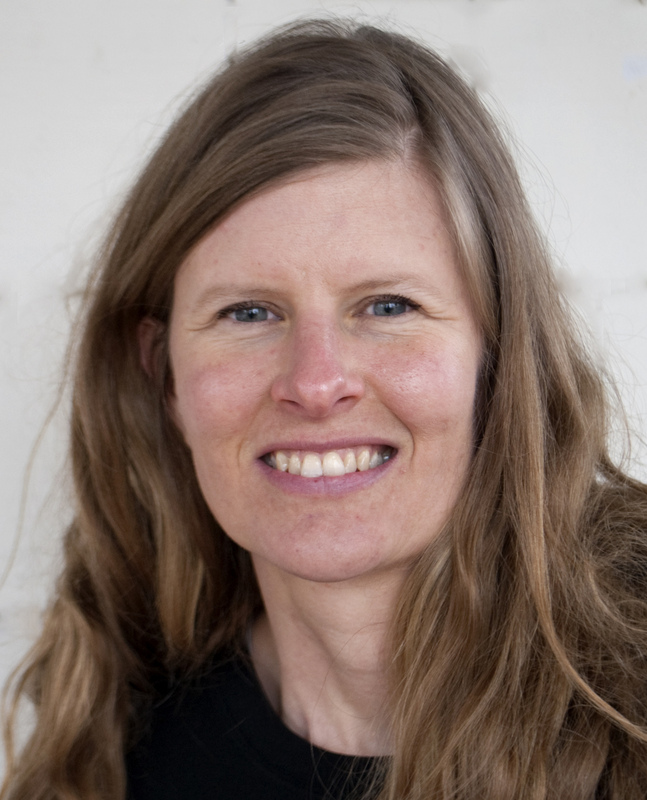 About the author: Christine Byl lives on a few acres of tundra north of Denali National Park outside the town of Healy, Alaska, with her husband and an old sled dog. 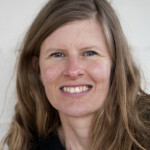 She received her MFA in fiction from the University of Alaska-Anchorage, and her stories and essays have appeared in magazines, journals, and anthologies. She owns and operates a small trail design and construction business. Very interesting. Favorite trail is Bobsled, a mountain bike trail in Salt Lake City, UT. Fascinating! I’d love to read it. This takes me back to my own traildog days in southeast Alaska. What amazing times those were. My favorite trail then was Petersburg Lake trail, now it’s the trail to Mt Dana in Yosemite. Not sure it is my favorite trail, but my most memorable trail experience was going to White Pine Like in UT with my wife at 6.5 months along with our first child. I have much respect for trail crews. Some of the hardest working folks around. With the Gila Wilderness in my backyard, there are way too many fantastic trails to choose a favorite. I haven’t even seen close to all of them yet! I guess my favorite trail is the Long Trail, which I through hiked a few years ago, although I’ve often said that the Basin-Cascade Trail in the (N.H.) Whites is my favorite low elevation trail, by some definition of low elevation. I’m excited to read this book. It sounds like a very different take on a trail memoir. I’m excited to hear a different perspective. I’ve been reading Ron Strickland’s book “Pathfinder” about building the PNT and I think it will be interesting to compare the two. I don’t think I have a favorite trail besides whichever one I’m on.